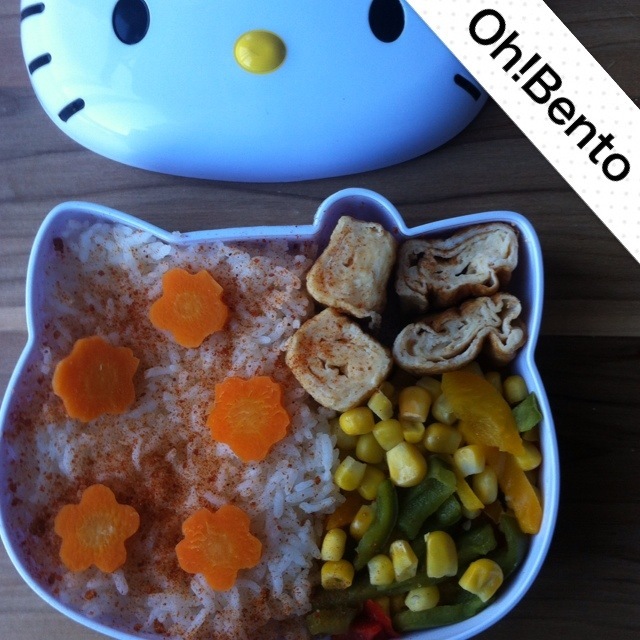 My entry into the #5forfriday bento task! As part of the #bentofamily on twitter as well as swapping pics of our bento achievements and recipes etc we sometimes like to give each other a challenge, thus #5forfriday was born! The task: create a delicious and healthy bento with only 5 ingredients! This may sound easy but it’s not, you never realise how many different elements make up a bento! Tamagoyaki, sweetcorn, peppers and carrots cut into Sakura and ume shapes. I’ve never participated in something like that. Seems fun though :-). Okay, I’ll give it a go next Friday :). I wondered where your entry was! I bet it would have been great!